Background Apps refer to the Apps that continue to be functioning and running in the background even though they are not actively in the app's window. In general, the purposes of background apps are used for sending notifications, checking for updates, sending and receiving information without needing the user to actively monitoring them. Having many Apps running in the background in Windows 10 could potentially slow down your operating system. Just like other regular Apps, background Apps will also consume your valuable system’s resources like battery, storage space, memory (RAM), and CPU. In fact, they’re probably one of the reasons why your Windows 10 speed is running slow. It would be a good idea to reduce the number of Apps that run in the background in Windows 10 as not all Apps are useful and relevant to stay in the background. Another reason for stopping background Apps is to protect your privacy as some Apps might be collecting your personal data like location or activities without your knowledge and consent. 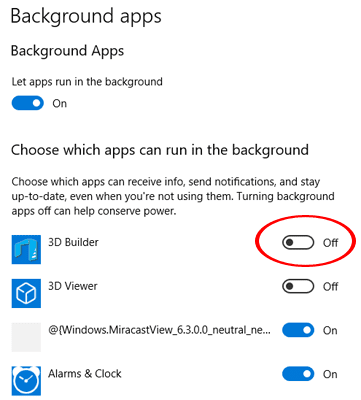 In Windows 10, there are options available for you to control which apps can be running in the background. Before you proceed, please note that by stopping an App from running in the background, may prevent it from working properly. For example, the Mail App will no longer notify you of new incoming messages after stopping the background function. Only proceed if you are certain that you no longer need the Apps to be running in the background. Here’s how to speed up Windows 10 by stopping background apps. Click on the Search icon located at the bottom left of your screen and type “Settings” to search. Under the best match, select Settings. From the Windows Settings screen that appear, click on Privacy option. Under App Permissions on the left panel, scroll down until you see the Background Apps and click on it. 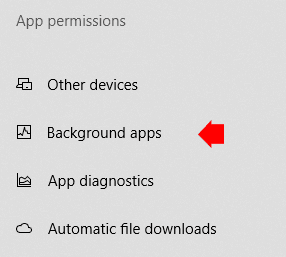 Under Background Apps screen, it will show you the list of Apps that are utilizing background services on your Windows 10. Click on the Toggle switch on the right of each App to enable or disable it from running in the background. It’s really that simple; the Apps won’t be running in the background anymore and your Windows 10 should perform faster by now. 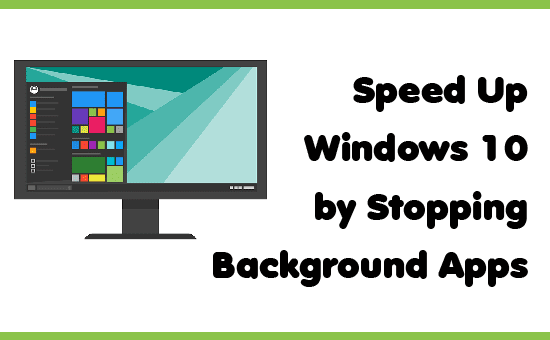 You just learned how to speed up Windows 10 by stopping background apps. If you have any questions, kindly inform us in the comments section below.